It has been far too long since I have focused on radio here at KoHoSo.us. I am delighted to return to the subject with an outlet I have been aware of but never got to check out and research until now. While the format is quite normal, the station itself is unique for a couple of reasons. WKIT is a commercial “classic rock” outlet licensed to Brewer, Maine and serving the Bangor market. The primary reason I am adding it to my Radio page is it’s one of the few remaining commercial music stations that has a live disk jockey in the studio at all times (minus a small handful of very good syndicated programs that run during part of the weekends). As for the second reason WKIT is notable…well, just take a look at the logo (which can be clicked upon to take you to WKIT’s website). Click on the logo to go to WKIT 100.3’s website! Yes, WKIT is owned by Stephen King along with his wife, Tabitha, under their company, The Zone Corporation, which also owns their AM outlet WZON that broadcasts a “progressive talk” format [see addendum below]. 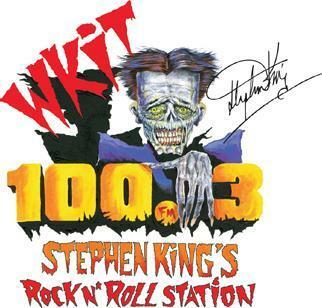 WKIT is a labor of love for the Kings and it shows in their investment in local talent, the playlist which is kept fairly wide, and the fun they have with it by adding Stephen’s literary reputation into the station’s identity. It is also a good lesson for other independently-owned outlets across the country that they do not have to give in to using outside programming services as WKIT consistently achieves the Bangor market’s number one rating. As it is the music of “my era,” there are quite a few classic rock stations on my Radio page. As of now, WKIT would be one of my top recommendations. I’m sure “Doug E. Graves” would love for more people to stop by and “dig” his station. 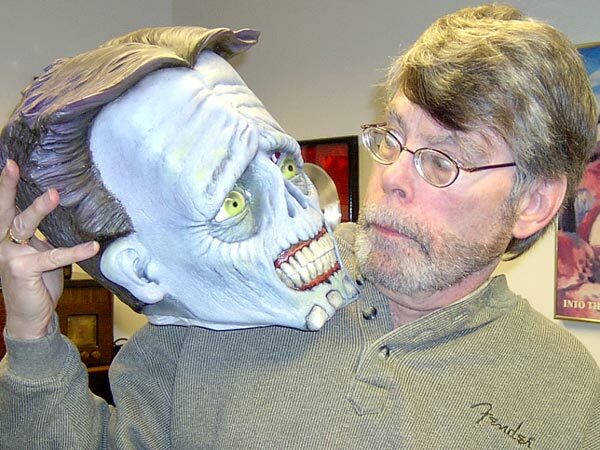 WKIT mascot Doug E. Graves and station co-owner Stephen King; from special effects artist Christian Hanson’s website, The Monster Closet (click on this photograph to be taken to Hanson’s Portfolio page where it is originally posted). One more note on a Maine radio station…I have removed WHSN of Bangor from my Radio list as a recommended stream. Unlike other removals, this is not for the usual reason of programming changes. It is more that nobody can see what the programming is anymore as the latest version of the WHSN website no longer has a program guide. In my view, this is crucial for any type of variety format outlet and, in the case of a college station, inexcusable that nobody could be found to do a little HTML coding to make a table or link to a PDF file. My removal of WHSN does not mean I now discourage people from continuing to listen to it. It simply no longer fits into what I would consider to be a “best stations” list if my readers from all over the world cannot find out when the various programs will air in their time zone. ADDENDUM 2014.04.23: Since this entry was written, WKIT changed its web address. This has been corrected in this post as well as on my Radio page. There has also been a change in the Kings’ other stations as WZON is now only on AM. The FM frequency that formerly simulcast WZON is now WZLO broadcasting an "adult album alternative" format. WZLO is also now featured on my Radio page. Posted in Internet, Media, Music, RadioTagged Bangor, Brewer, classic rock, Maine, Stephen King, WKITBookmark the permalink.